Recognizes research excellence by a graduate student in applied polymer science. This award was established in 1985 as the Sherwin Williams Award in Applied Polymer Science who continued their support until 1996. Since then, this award has been supported by ICI (1997-2008), AkzoNobel (2009-2013) and Eastman Chemical (2014 – present). Each finalist (up to 6) will receive up $900 for out-of-pocket expenses to attend the Fall National ACS Meeting and deliver an oral presentation on his or her work at the Eastman Chemical Award Symposium (part of the PMSE Division technical program). All finalists will also receive a one-year complimentary membership in the PMSE Division. Awarded to an individual selected from among the finalists, the Eastman Chemical Student Award consists of a $1,600 award and an engraved plaque presented at the following Spring ACS National Meeting. Graduate students, either currently in graduate school or not more than one year beyond graduation. The submission includes an abstract and a preprint of up to two pages conforming to the former PMSE preprint format (supplied upon request; see below). Up to six finalists will be selected by the PMSE Eastman Chemical Student Award Committee based on the scientific merit of their abstract and preprint. Each of the selected six nominees will deliver an oral presentation at the Fall National ACS Meeting’s Eastman Chemical Award Symposium. During this symposium, the award winner will be selected by judges based on the quality of his or her written application and oral presentation. The PMSE Division is pleased to announce that Dr. Jeffrey Lopez is the winner of the 2018 Eastman Chemical Student Award in Applied Polymer Science. This Award, sponsored by Eastman Chemical Company and administered by the PMSE Division, is given for the best paper presented at the Eastman Chemical Award Symposium as part of the PMSE program at the Fall 2018 National ACS Meeting in Boston. The Eastman Chemical Award Program represents a key program of PMSE Division with a distinguished list of sponsors and award winners since its inception as the Sherwin Williams Student Award in 1985. Dr. Lopez completed his doctorate in Chemical Engineering at Stanford University where his Ph.D. advisor was Professor Zhenan Bao. Dr. Lopez is currently employed as a postdoctoral associate in the Research Laboratory of Electronics at the Massachusetts Institute of Technology. The title of his paper, presented at the recent Fall ACS Meeting in Boston, MA was “Understanding the Influence of Polymer Properties on the Stability of High Capacity Silicon and Lithium Metal Anodes.” The other finalists who presented at the Award Symposium were Dr. Xiaoran Hu (Tufts University), Sandra Pittelli (Georgia Institute of Technology), Johanna Schwartz (University of Washington), and Zhongbo Zhang (Case Western Reserve University). 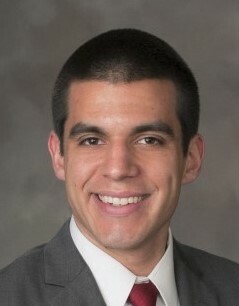 As the 2018 Eastman Chemical Student Award Winner, Dr. Lopez will be will be presented with an award plaque and a check for $1600 at the Joint PMSE/POLY Awards Reception at the Spring 2019 ACS Meeting in Orlando, FL.